The Whiting Pierogi Fest® is presented annually by the Whiting-Robertsdale Chamber of Commerce. Drawing over 300,000 visitors each year, Pierogi Fest® is the pride of Whiting, IN. It welcomes all to celebrate our heritage while poking a little fun at ourselves at the same time. Where else can you see grown women dressed up like our grandmothers (buscias, as we say) in housecoats and babushkas? Or the lawnmower brigade strutting through town with sandals and socks on like our dads did? You’ll also see life-size polish pastries and goodies walking and talking waiting to take a picture with you. 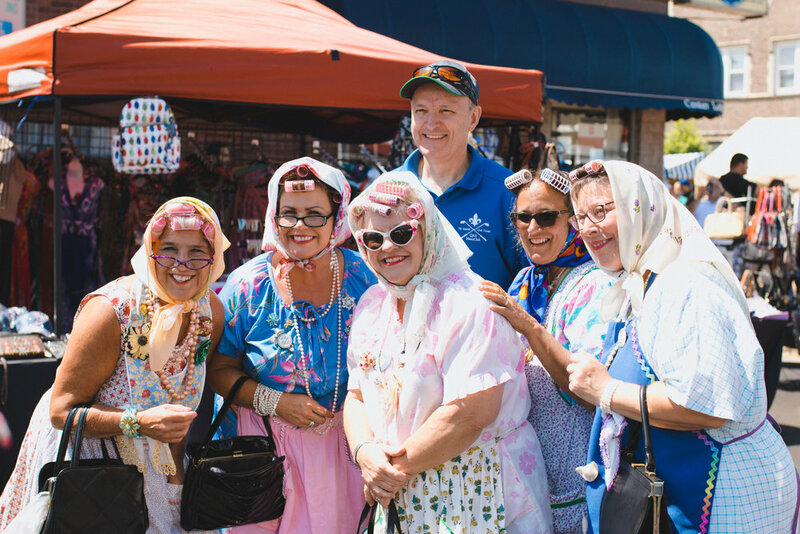 Pierogi Fest® began when Marty Dybel, Tom Dabertin and Darlene Beerling sat down one afternoon to discuss Marty’s idea to creating a festival that celebrated Whiting-Robertsdale’s ethnic heritage, including family memories, customs and food. It was decided it would be a real honor to their ancestors to celebrate and retain part of that special heritage. All they needed was a symbol to pin it on. That symbol was the innocent and darling little Eastern European dumpling: the pierogi (or pirohi, depending on your grandma). Some people still trill the “r” when they say it, just like buscia and jaja did. COME ONE, COME ALL to Whiting's 119th Street as it's transformed into a freak show. We've got clowns, freaks and maybe even a few geeks roaming through town. Check out our aerialists and freak show artists along the midway! Scare addicts can shop the Market of the Living Dead for all types of Halloween, sci-fi & horror items. Get “Trapped in a Room with a Clown” and solve riddles to get out, before they get you! (Featuring the Clowns from the FOP Haunted Hayride.) This is the only event of its kind in the Region, celebrating everything Halloween! It’s about to get wicked in Whiting!